BRIDGEWATER, Maine — As parts of Aroostook County are under a flood watch amid rain and snow melt, officials closed the Packard Road in Bridgewater on Sunday evening due to flooding. 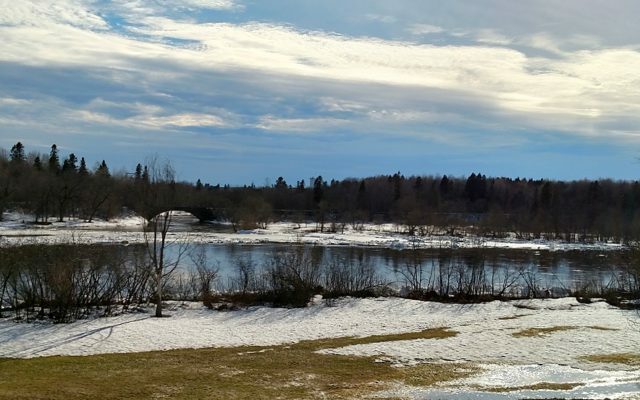 Meteorologists and emergency management officials also are keeping a close watch on the Aroostook and St. John rivers where ice jams could cause flooding problems. Craig Ouellette of St. Francis took this photo of the St. John River on Sunday, April 14, in front of his home near the Narrow Gauge. The Aroostook County Emergency Management Agency reported that the Bridgewater Fire Department closed the road at around 7:25 p.m. on April 14. Packard Road runs about four miles to the northwest off of Route 1 and crosses the south branch of Three Brooks and Dead Brook Stream shortly before coming into the town’s center. Firefighters went door-to-door to inform residents, the agency said. Local police reported Monday afternoon that rain and snowmelt was causing minor flooding in Bridgewater. In addition, the National Weather Service in Caribou advised that overflowing poor drainage areas could cause minor flooding along Route 1 that evening. Following the warmest weekend since last fall and an expected inch of rainfall Monday, the NWS issued a flood watch for parts of the region, including a flood advisory for the Aroostook River in Washburn. “The potential exists for minor flooding, especially along low lying areas along the Aroostook River in Washburn and Wade,” the NWS reported. By mid-afternoon on Monday, the river level in Washburn had risen to 15.27 feet, a little more than half a foot above flood stage. A second NWS alert confirmed that the “ice jams in place near Washburn and Crouseville and continued river rises will cause low land flooding” in those two communities as well as Wade. There also have been ice jams reported on both the Allagash and St. John rivers up in Allagash but the St. John River has opened up considerably in the St. Francis area, according to Craig Ouellette, who lives near the Narrow Gauge along the waterway in St. Francis and has been monitoring the situation there. There is no cause for alarm yet in Fort Kent, which is located about 19 miles down the river from St. Francis, according to Fort Kent Police Chief Tom Pelletier. The FKPD is currently tracking St. John River levels hourly in the town. As of Monday morning at 11 a.m., the river measured at 14.25 feet, still well under flood level which is 22.5 feet. While the river levels are on their way up due to rain and melting snow in the area, the water levels are still so low that there is no cause for concern at this point, Pelletier said. The National Weather Service and Emergency Management Agency officials remind drivers never to cross a road that is or seems to be flooded. Aroostook EMA Director Darren Woods suggested County residents check out the Aroostook County Flood Watch Facebook page, launched with the purpose of notifying folks of any floods. The page contains notifications about potential flooding emergencies and the public is also welcome to submit pictures of floods or bodies of water that are near flooding. In addition, people looking to find out about road conditions, can visit the traveller information system website New England 511 at /newengland511.org. Writer Jessica Potila of the St. John Valley Times and Chris Bouchard of the Aroostook Republican contributed to this report.